This week the children of Room 9 started their personal inquiry on an aspect of New Zealand history. The idea is for every child in the class to become an expect in one area and then teach someone at home about what they have discovered. We started by making a big question that we wanted to know the answer to. This is an open question that required lots of information to answer it. We then thought of sub questions that would help us answer the big question. Last Thursday we used the www to find the answers to our questions. It was tough going because we had to do a lot of skimming and scanning to find the correct information quickly. We still have a lot of information to find. It is really important to use other sources to find information like looking in reference books and asking an expert! 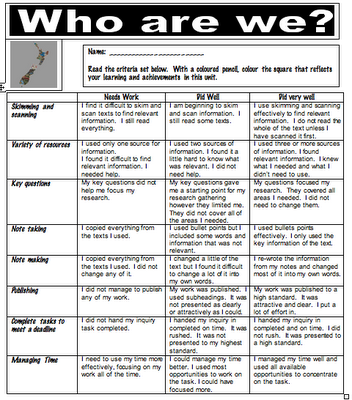 Below is the rubric we are using to to reflect on the learning process and to help us keep on track. What wonderful costumes - congratulations to you all.